PennsylvAsia: 2016 Stephen Chow movie The Mermaid (美人鱼) at Oakland's Carnegie Library, October 7. 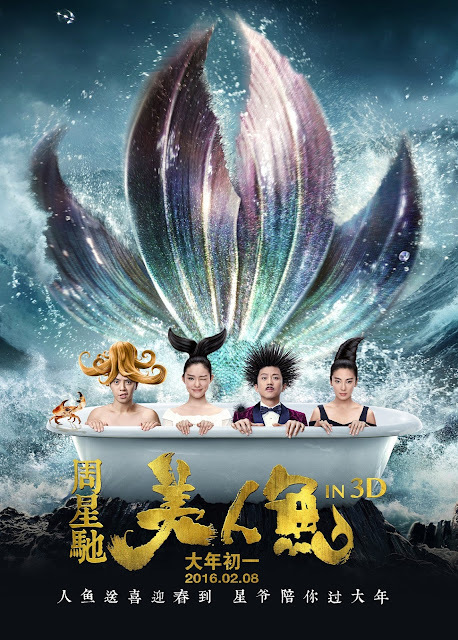 2016 Stephen Chow movie The Mermaid (美人鱼) at Oakland's Carnegie Library, October 7. Mermaid is a solid dramedy with heart and, more importantly, a message. This Chinese production tells the story of Liu Xuan (Deng Chao) a young business mogul attempting to clear a recently acquired bay of its marine life for property development. Unbeknownst to him (and the rest of the world), the waters are home to a clan of mythical half-human, half-fish creatures, who send one of their own to kill Liu. Posing as a human, the mermaid (newcomer Jelly Lin Yun) ends up falling in love with Liu. With real documentary footage of water pollution, dying sea life and the destruction of natural resources spliced into the film’s opening montage, it’s clear from the start what Chow is trying to say. Credit to the 53-year-old star, then, for crafting a morality play that features the CGI-heavy visual effects that Chinese audiences love so much. There are laughs too, so it’s hit and miss: an early scene, of the mermaid clan’s failed attempt to take Liu’s life despite deploying a vast armoury of weapons, successfully evokes the manic shenanigans of older Chow films; other gags, like an overweight male actor dressing up as a mermaid, fall flat. Stephen Chow-style mo lei tau gags only work when Chow is involved. The movie will play on October 7 from 2:00 to 5:00 pm and is free and open to the public. The library is located at 4400 Forbes Ave. in Oakland (map) and is accessible by buses 28X, 54, 61C, 61D, 67, 69, 71A, 71B, 71C, 71D, and 93.